This afternoon, I grabbed my Nikons and headed out to see if I could find anything good to photograph. I was driving down River Road in Boscawen, I decided to snap a shot or two of the cornfield. 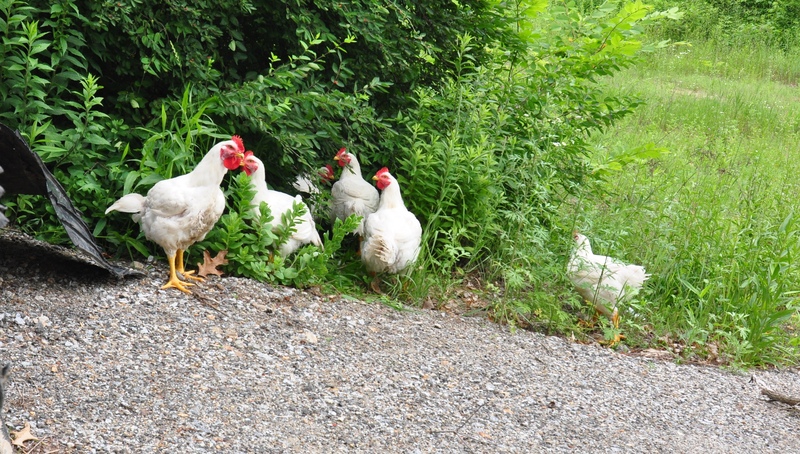 As I approached the area – I noticed two chickens beside the road and then four more. I couldn’t imagine where they came from since the closest farm is a dairy farm. All six of the very big white chickens with red combs were huddled together under a bush. I noticed that at least one was limping and some of their skin was showing because feathers were gone. They looked scared – but let me get fairly close to them. I told them (yes – I actually spoke to them) that I would get help. I got back in my car and drove down the road to the nearest house. No one answered my knocking. I then went to the next house and they said maybe the people at the end of the road lost their chickens. I drove to that house which is for sale and no one was home. I ended up going to the dairy farm relatives at the other end of River Road and a woman helped me. She put a large wooded box in the back of her 4×4 type vehicle and gathered some help. All six chickens were successfully rescued from the side of the road. She knew someone with chickens who she said she would bring them to. I felt good helping out these poor creatures. I went back to collect my tarp we used to cover the box, and she told me that her friend with the chickens said these were broilers not laying chickens and that they most likely wouldn’t last the day. They were in bad shape 😦 I believe they were put out of their misery. You wonder how these poor creatures ended up on a back road in Boscawen. It wasn’t a road that a truck load of chickens would go down. We will never know how they found themselves there. I hope no one just dumped them there – figuring that they were setting them free and that the chickens would be fine. It was sad to see them huddled under the bushes. I hope they were not suffering out in the elements long. Maybe them being there was just an accident. I hope so – because the thought of someone just dumping poor defenseless creatures on the side of the road is very sad. The ending wasn’t what I wished for these chickens, but at least they were spared suffering and a slow death. Good for the both of you helping the wee creatures too. 🙂 It is a hot one here today and humid – but you are probably warmer and more humid in Virginia! Have a great day and thanks for visiting my blog!